November 1, 2018 /3BL Media/ - T. Rowe Price’s 2018 Parents, Kids & Money Survey, which sampled 1,013 parents of 8 to 14 year olds nationally, found that parents who try to get everything on their kids’ holiday wish lists are more likely to report that they have gone into debt for their kids, worry that they’re spoiling their kids, and have kids who are less likely to save their own money. Additionally, parents who participate in promotional days, such as Black Friday and Cyber Monday, are more likely to splurge. The survey was conducted in January 2018, shortly after the 2017 holiday season. “We all want our kids to have amazing and memorable holidays, but there’s evidence that being overly generous has consequences” says Stuart Ritter, CFP®, a senior financial planner at T. Rowe Price and father of three. “Kids may be picking up the wrong lessons from their parents when they don’t have to prioritize the items on their holiday wish lists and make trade-offs. Creating a holiday wish list can be an opportunity to help them understand that even the generous holiday spirit has limits, and we all must make trade-offs. “Parents who try to get everything on their kids’ wish lists need to keep in mind the financial consequences. They need to ensure that they aren’t taking on additional financial burden at the expense of other goals, such as saving for a vacation, home renovation, new car, their kids’ college, or their own retirement,” says Mr. Ritter. To help parents have conversations with kids about setting goals and making trade-offs, T. Rowe Price created MoneyConfidentKids.com, which provides free online games for kids; tips for parents that are focused on financial concepts such as goal setting, spending versus saving, inflation, asset allocation, and investment diversification; and classroom lessons for educators. Trying to get everything on kids wish lists may have hidden costs for parents: Parents who try to get everything on their kids’ wish lists are more likely to finance their holiday spending (51% vs. 44%) and say that they have gone into debt to pay for something their kids wanted (48% vs. 26%). They are also less likely to have retirement savings (42% vs. 56%) and more likely to currently have a payday loan (10% vs. 4%). Kids may be getting the wrong message from when parents are overly generous: When parents say they try to get everything on their kids’ wish lists, they are also more likely to report that they’ve tried various ways to get their kids to save their money, instead of spending it right away, to no avail (69% vs. 51%). Additionally, they are more likely to admit that their kids spend their allowance as soon as they receive it (56% vs. 38%). Nearly half of parents finance holiday spending: 46% of parents use credit cards to finance their holiday spending or have taken a payday loan to cover it. This includes 22% of parents who continue to pay off credit card balances from holiday spending more than six months after the holidays. Parents rely on current income and credit cards to cover holiday spending: Parents cite current income (67%) as the most popular way to cover holiday spending. However, credit cards (61%) are a close second, and only 28% of parents who use credit cards for holiday spending pay of their balances in full within one month after the holidays. A minority of parents use more costly methods of covering holiday spending: To cover holiday spending, 10% of parents have dipped into their emergency fund, 7% have taken a payday loan, and 4% have withdrawn from retirement savings. Parents actively take advantage of promotional days: Last year, 72% of parents participated in a promotional holiday, with Black Friday online shopping and Cyber Monday being the most popular (46% of parents participated in each), followed by shopping in stores on Black Friday (38%), Small Business Saturday (11%) and Giving Tuesday (5%). Promotional days are associated with splurging: Parents who participated in a promotional day are more likely to say that they spent more than they should have (62% vs. 53%), use credit cards to pay for holiday spending (63% vs. 54%), spend more than $1,000 on the holidays (48% vs. 28%), shop for themselves (54% vs. 36%), and spend more on themselves than their kids (17% vs. 10%). Online shopping has increased: The percentage of parents that shop in stores exclusively has dropped significantly from 28% in 2017 to 11% in 2018. More parents say that they shop mostly online, but some in stores in 2018 (43%) compared with 2017 (29%). But brick and mortar stores are still relevant: Only 2% of parents said they shop exclusively online in 2018, unchanged from 2017. The percentage of parents that shop mostly in stores, but some online has also largely remained the same between 2018 and 2017 (45% and 42%, respectively). Many parents save for the holidays throughout the year: 55% of parents say that they normally save for the holidays throughout the year, with most holiday savers starting to save mid-year (49%) and many starting right after the holidays (40%). 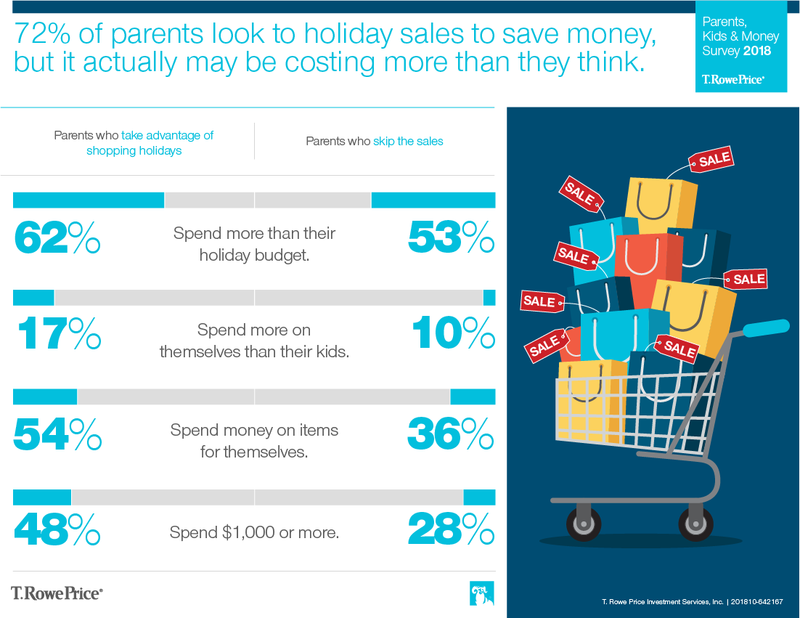 More than half of parents spend less than $1,000: 58% of parents say they normally spend less than $1,000 on holiday costs. A minority (19%) say they spend more than $2,000. Founded in 1937, Baltimore-based T. Rowe Price Group, Inc. (NASDAQ-GS: TROW) is a global investment management organization with $1.08 trillion in assets under management as of September 30, 2018. The organization provides a broad array of mutual funds, subadvisory services, and separate account management for individual and institutional investors, retirement plans, and financial intermediaries. The company also offers a variety of sophisticated investment planning and guidance tools. T. Rowe Price's disciplined, risk-aware investment approach focuses on diversification, style consistency, and fundamental research. For more information, visit troweprice.com or our Twitter, YouTube, LinkedIn, Instagram, and Facebook sites.